The past two weeks have been bad. So bad that I didn't even bother to weigh in yesterday. I just couldn't bring myself to stand on the scale and see my failure (two weeks in a row). I'm not going to whine or make excuses, all I am going to say is that today is a new day! I'm going to just forget about my failures (and all of that binge eating) and focus on starting fresh! I'm off to a good start today with 3 glasses of water and a Clif Bar for breakfast. Grace and I went outside to play for a bit this morning. Mostly she played while I tried to enjoy some shade! But I did get the kite out and fly it for a bit when it got a little too windy for her to play in her bounce house. Have you seen those news stories about the bounce houses blowing away with kids in them? I've gotten three warnings from relatives about it from My Gram, my Mom and my 11 year old niece! Even with the breeze, it was still really hot out there! 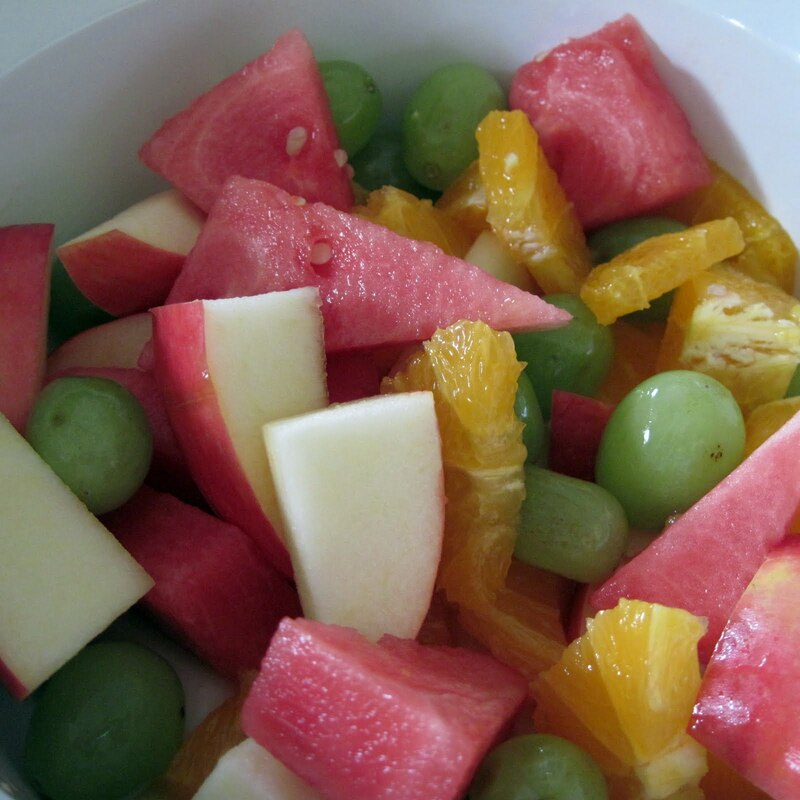 After deflating the bounce house, bringing the kite down and getting Grace and Remmy in the house with cool drinks, I'm thinking that a cool, refreshing fruit salad will be the perfect thing for lunch with a bit of yogurt! Good choices so far today! Let's hope I can keep it up for the rest of the week! 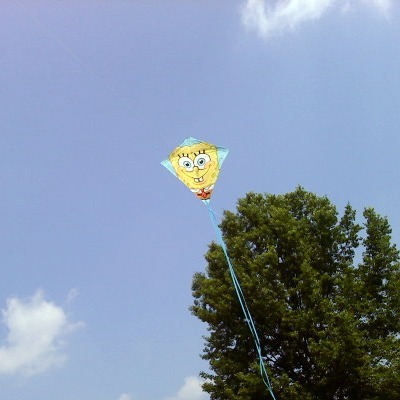 Check back to see more pictures of our kite flying fun on Wordless Wednesday! O' Alison I've been very bad today, but sometimes I just have to, watching everything and constantly trying to eat healthy(husband is diabetic)sometimes I'm just bad,SO SORRY! But I think I'll have fruit salad tomorrow too.I'll get back on track. I think your awesome, and so dedicated. Don't visit LazyonLoblolly, you'll be mad as fire(with me),teehehe. It is ok, baby..I will do enough whining for the both of us. And I have vowed to look at every blog on the StS linky. There is still a lot of Summer and as you like fresh fruit...that, too. Sometimes a race horse that paces back ends up gaining momentum and gets right up there in front- surprisingly. Well, part of the challenge is support and accountability. So, you know what girlfriend - I recommend you step on the scale. I in no way shape or form wanted to do that last week and it recorded a 6 or so pound gain. I did it anyway so I had a starting point, then this week I had an 8 pound loss. You have to know where you're starting from. Not having weighed in 2 weeks is a long time. Get a number and get your footing back - you can do this. You are worth it. I understand your reluctance to look at the number you fear on the scale. I have been there. You do need to take responsibility for that number so you might as well look at it - it may not be as bad as you think. Use it as your motivation to do something about it. We can get all the support and encouragement in the world but it comes down to you and the food. Who's in charge? Get mad and get to it. I'm with downsizers...no hiding from the scale. It's just a number that helps you track your progress, not a punishment. Just. A. Number. See it, then do what you need to do! Track your food, that is my suggestion. It really helps. Keep it with you everyday. A new week, but make it count. You kids deserve a fit and healthy mom. You can do this. A new day, indeed! That fruit looks awesome! Me, too...I've been BAAAAAD! And now I'm not. Hang in there--and we'll work it this week!